Notes: Warkworth Castle is a ruined medieval building in the town of the same name in the English county of Northumberland. The town and castle occupy a loop of the River Coquet, less than a mile from England's north east coast. When the castle was founded is uncertain: traditionally its construction has been ascribed to Prince Henry of Scotland in the mid-12th century, but it may have been built by King Henry II of England when he took control of England's northern counties. Warkworth Castle was first documented in a charter of 1157-1164 when Henry II granted it to Roger fitz Richard. The timber castle was considered "feeble", and was left undefended when the Scots invaded in 1173. Roger's son Robert inherited and improved the castle. 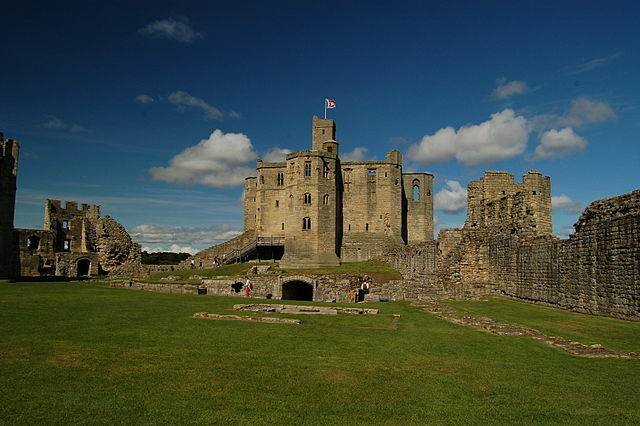 Robert was a favourite of King John, and hosted him at Warkworth Castle in 1213. The castle remained in the family line, with periods of guardianship when heirs were too young to control their estates. King Edward I stayed overnight in 1292 and John de Clavering, descendant of Roger fitz Richard, made the Crown his inheritor. With the outbreak of the Anglo-Scottish Wars, Edward II invested in castles including Warkworth where he funded the strengthening of the garrison in 1319. Twice in 1327 the Scots besieged the castle without success. John de Clavering died in 1332 and his widow in 1345, at which point Henry de Percy, 2nd Baron Percy, took control of Warkworth Castle, having been promised Clavering's property by Edward III. Henry Percy, 1st Earl of Northumberland, added the imposing keep overlooking the village of Warkworth in the late 14th century. The fourth earl remodelled the buildings in the bailey and began the construction of a collegiate church within the castle, but work on the latter was abandoned after his death. Though Algernon Percy, 10th Earl of Northumberland, supported Parliament during the English Civil War, the castle was damaged during the conflict. The last Percy earl died in 1670. In the mid-18th century the castle found its way into the hands of Hugh Smithson, who married the indirect Percy heiress. He adopted the name "Percy" and founded the dynasty of the Dukes of Northumberland, through whom possession of the castle descended. In the late 19th century, the dukes refurbished Warkworth Castle and Anthony Salvin was commissioned to restore the keep. Alan Percy, 8th Duke of Northumberland, gave custody of the castle to the Office of Works in 1922. Since 1984 English Heritage has cared for the site, which is a Grade I listed building and a Scheduled Ancient Monument.